Wave Flex Business Checking – Flexible pricing on your terms. Wave Preferred Business Checking – Unlimited transactions plus interest. $15 monthly fee waived with daily minimum balance of $10,000 or more. WaveWorks – For you and your employees. 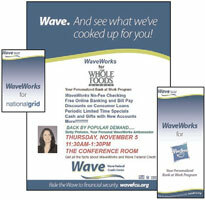 WaveWorks is our personalized Bank at Work Program. It is in place at a number of companies including Hasbro, WholeFoods, Stanley Bostitch, Mahr Federal and Warwick Municipal Employees. While WaveWorks contains many standard company and employee benefits, it is individualized to the particular requirements of each business and is coordinated by a WaveWorks Ambassador. 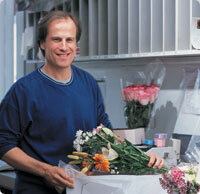 Put WaveWorks to work for your company! Start riding the wave with your business today. To open an account, find out more about our other business services or speak with a business services representative, visit a Wave office or call us at (401) 781-1020.